Babywearing is great for so many reasons – bonding, long-lasting cuddles, healthy physical development, getting things done – and we think that when your baby is on you, your baby’s in the very safest place. There’s no better way to monitor your baby when you’re in direct contact. But it’s always important to keep a few safety tips in mind when using any type of baby carrier, which is what we want to share with you here. There are also a few “tricks of the trade” that can make your babywearing experience more comfortable and enjoyable. Some of these tips can apply to any type of sling, wrap or baby carrier, but since we make soft-structured carriers (SSCs), we thought we’d focus on SSCs. Always wear your baby with your carrier adjusted so that the fit is snug. There are spaces between the shoulder straps, shoulder strap connections and waist belt that, if your SSC is worn too loosely, can allow your baby to fall through. Always check your carrier to make sure it’s in good condition. Wear and tear can effect all types of sewn fabric items, including baby carriers. Each time you grab your baby carrier, do a once-over to be sure that all the stitching, buckles and webbing is in good condition and not damaged. If it’s damaged, don’t use it. Always make sure that you can see your baby’s face. If your baby is slumped down in your carrier, your baby’s airways will be restricted, making it more difficult for your baby to breathe. This is particularly true for newer babies. Never cover your baby’s face completely, whether in a jacket or with a blanket. 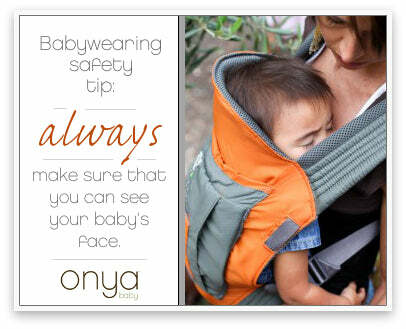 This tip applies to all types of baby carriers, including wraps and slings. Trying to get a better seat? Once you get your baby in your carrier and your waist belt adjusted, try this: lift your shoulder straps straight up off your shoulders while gently bouncing. Your baby will settle beautifully into the seat of your carrier. Feeling the weight on your shoulders? In order to get the weight off your shoulders and onto your hips, try this: adjust your waist belt so that it’s on the top of your hips and tighten it so that it’s nice and snug. Adjust your shoulder straps so that they’re snug, but not overly tight. By emphasizing the support on your hips and easing up on your shoulders, you’ll be sure to be distributing your baby’s weight to where it should be: your hips. Want to reign in all those straps when it’s time to put it away? 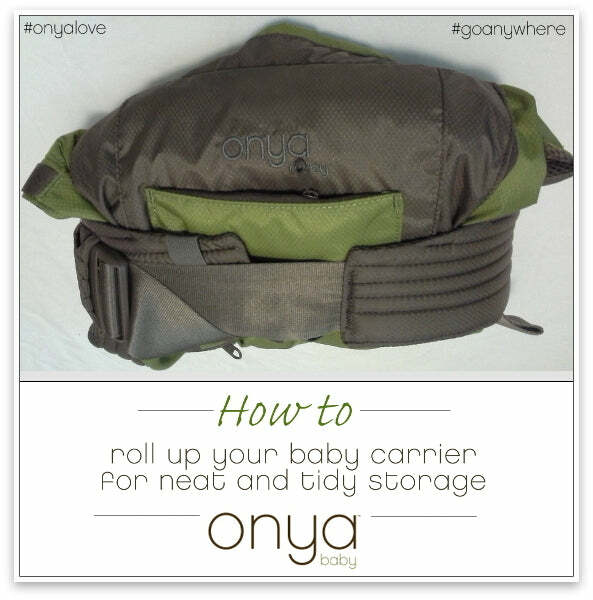 Roll your carrier up in a nice, tight roll with the shoulder straps tucked inside. The outside of your baby carrier is facing out. Now take the waist strap and strap it around the roll of your carrier. Buckle it. Snug it up and you’re good to go. No more dangling straps all over the place. Huzzah! And maybe the greatest tip? Find a babywearing group near you. When you join in your local babywearing group, you’ll connect with like-minded parents, meet with knowledgeable babywearing instructors, and get the chance to try different types and brands of baby carriers, which is key in finding you and your baby’s perfect babywearing match. Be sure to follow the link to see if there’s a babywearing group near you. There’s a ton of them out there, and we do our best to keep our large list of regional babywearing groups updated. We hope you find one near you!